January is National Soup Month. (Big Surprise – it’s also National Hot Tea month, something the Grow It Eat It crowd can plan for next summer when the mint and raspberry and strawberry leaves are available). “Soup, “ according to Christopher Robin (Winnie the Pooh) “is a comforting sort of thing to have.” Even better when you have the satisfaction of having grown at least some of what’s in it yourself. As I said, this kale isn’t mine, but I’m fortunate to live down the road from uncertified but definitely organic Colchester CSA to which I’ve loaned my rototiller. As a result, Theresa Mycek, the manager/farmer will often give me some veggies, including several varieties of the beautiful kale she grows. Yet this stuff didn’t come from her either since she’s selling what she still has in the fields to one of the local restaurants, and I don’t take anything that could turn into revenue for the CSA.In this case, I didn’t grow the kale I’ve just chopped for today’s lunch, but I’m definitely going to eat it. 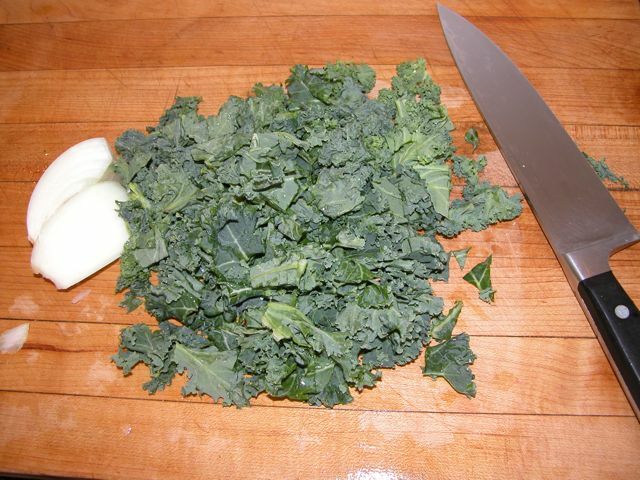 I had Red Russian kale early in the season – though it was not much to sneeze at, sadly. I had started it in the greenhouse, planted the seedlings out in the garden in Feb. with high-ish hopes as an experimental thing beneath what turned out to be a very flimsy cold frame. A big wind collapsed the cold frame, so I covered the seedlings with row cover. It saved enough to make several soups with, and I got more from a later direct seeding. SO, I got the kale at the supermarket, and am still glad to have it. Kale is one of those super-foods – a great spring tonic after heavy holiday meals, and a vitamin-packed leafy green that’s easy to cook in a variety of ways. Sometimes I sauté it in olive oil with shallots and salt and pepper for lunch (I have a home office). Sometimes I make kale, bean and tomato soup using some of the dried beans I’ve grown along with the tomatoes I’ve grown and canned and feel inordinately, goeth-before-a-fall-type pride in. But on busy days, or when I just want something light, I chop kale with a little onion and cook it in a little frozen homemade stock, which is what I’m doing today. This time, it’s lamb stock, made from the leftover roasted leg of a freezer lamb I bought from a friend down the road. Once you have good homemade stock in the freezer, soup is just about fifteen minutes away. Even if the stock starts out frozen. I freeze mine in quart or half-gallon plastic containers, which is easy to stack in the chest freezer. Take one out, run the unopened container under warm water to loosen the sides so it will slide out into a pot. Cover the pot and put it on low to thaw while you’re chopping up vegetables or opening canned beans or a jar of tomatoes or whatever. When it’s thawed –or even before – throw in the vegetables, simmer on medium heat until they’re done to your satisfaction and serve. Smells great, tastes great and is virtuous. What more do you want for National Soup Month? There’s a recipe for Roasted Iranian (or any other winter squash for that matter) Soup at http://nancytaylorrobson.wordpress.com/ .